Speedsters and reckless riders on bicycles, e-scooters or other personal mobility devices (PMDs) now face stiff fines and even jail time. The Land Transport Authority (LTA) said yesterday that it was exercising its powers with immediate effect against those who fail to stop speeding or observe regulations set out in the Active Mobility Act that has kicked in. 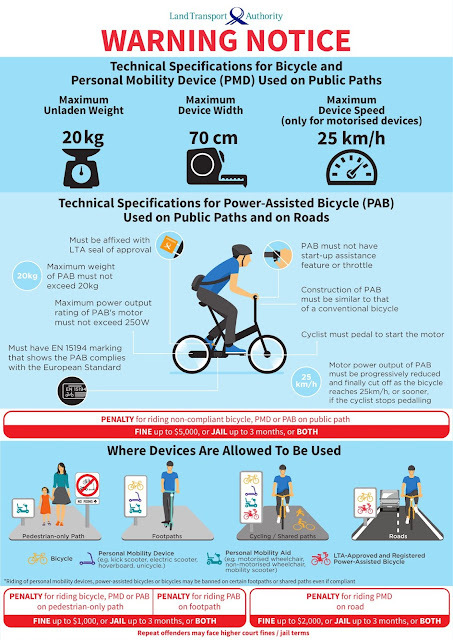 Its powers regulate the use of bicycles, PMDs and power-assisted bicycles (PABs) on footpaths, shared cycling paths and roads, as well as their sales, the LTA's statement added. The new law spells out where the devices may be used and how fast they can go. For example, PABs are not allowed on footpaths, while e-scooters cannot go on public roads. The speed limits are 15kmh on footpaths and 25kmh on park connectors and shared paths. First-time offenders who flout the usage rules and speed limits may be fined up to $1,000 or jailed for up to three months, or both. Repeat offenders may have their fine and jail term doubled. The new law also sets limits on the size and speed of the devices that can be used on public paths. These cannot weigh more than 20kg each and must have their speeds capped at 25kmh. Those who use devices that flout these rules can be fined up to $5,000 and jailed for up to three months, or both. In the case of hit-and-run accidents, those who do not stop to help accident victims face a maximum fine of $3,000 or a jail term of up to one year, or both. Those who refuse to give their particulars or lie to LTA enforcement officers face a higher maximum fine of $5,000, in addition to the maximum one-year jail term. Besides users, the new law also targets vendors of non-compliant devices. Those caught selling them may be fined up to $5,000 and jailed for up to three months, or both. The LTA said it has been holding safe-riding clinics for users and dialogues with retailers to prepare the public and industry for the new law. The Active Mobility Act was passed by Parliament in January last year. At the time, then Senior Minister of State for Transport Josephine Teo said it was introduced to safeguard the safety of pedestrians even as active mobility was encouraged to support a car-lite Singapore. "There is not a shadow of doubt that pedestrian safety is paramount," she had said. After the Act was passed, the Government kept mum on when it would take effect. 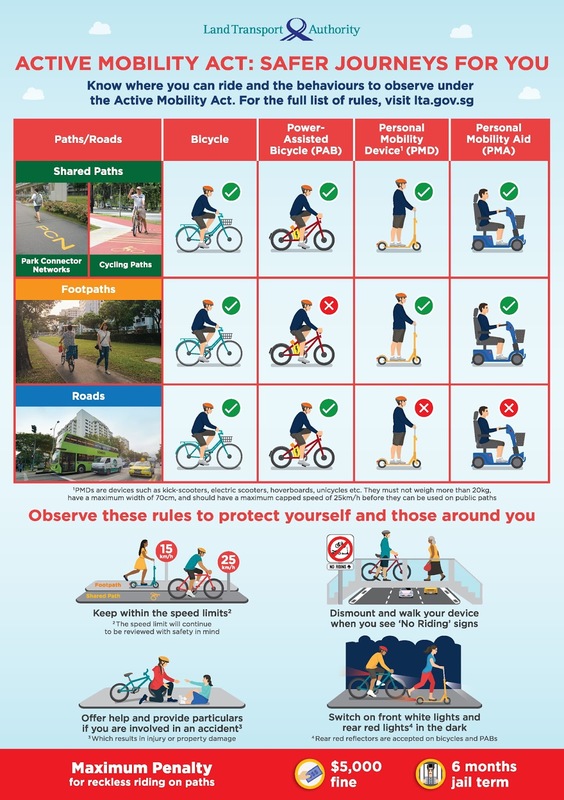 Early last month, a government panel formed in 2015 to develop a set of rules governing the use of footpaths and cycling paths was still gathering public feedback on how cyclists and PMD users should behave when travelling on footpaths and in crowded areas, including whether they should ride more slowly than the recommended top speed of 15kmh that has now become law. The LTA's surprise announcement yesterday came on the back of the rising problem of reckless riders as PMDs become more popular. On average, there are about three accidents a week involving users of mobility devices. There were 110 accidents between January and September last year, with about 30 of them occurring on public paths and involving pedestrians and a mobility device. The rest took place at road junctions and on roads when users flouted traffic rules. 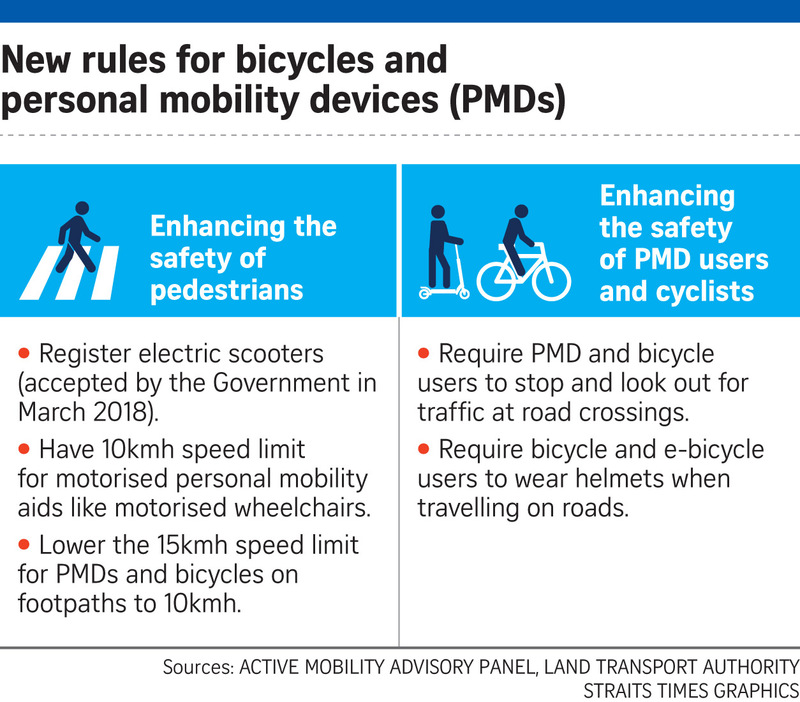 Besides having to observe rules set out under the new law, those who own PMDs will have to register their devices from the second half of this year. The exact start date for registration has not been announced. Enforcement officers are now equipped with speed guns to catch cyclists and e-scooter users who break the speed limits on paths. The Land Transport Authority (LTA) officially deployed such devices on Tuesday, the same day that the Active Mobility Act took effect, giving the authority more powers to deal with errant riders. The Act regulates the use of bicycles, personal mobility devices (PMDs) and power-assisted bicycles on paths, with penalties such as fines and jail time that can be meted out to offenders. 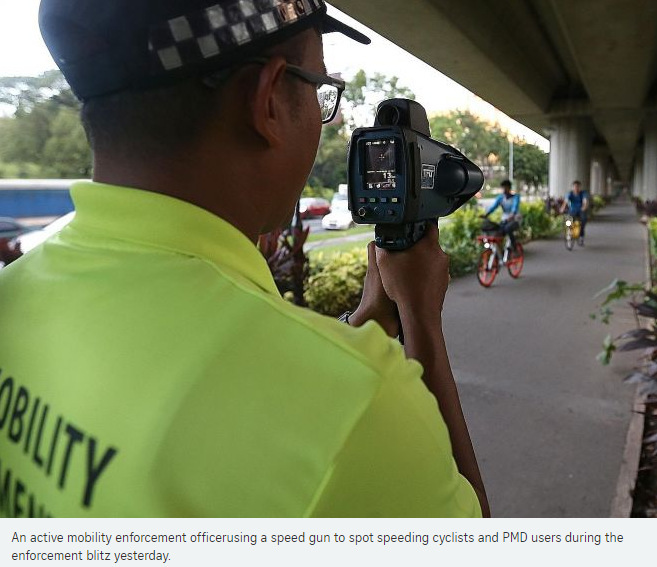 The media was shown the use of the speed guns by the LTA's active mobility enforcement officers during an enforcement blitz held at the junction of Yishun Avenue 2 and Avenue 7 yesterday. The guns have a range of up to 1km, and also video-recording capabilities. Under the Act, cyclists and PMD users must keep to a speed limit of 15kmh on footpaths, and 25kmh on shared paths and cycling paths. Those caught speeding can be fined up to $1,000 or jailed for up to three months, or both. During the two-hour operation yesterday, PMD users - mostly e-scooter riders - were also pulled over and had their devices weighed and measured. The Act mandates that PMDs cannot weigh more than 20kg, must not go faster than 25kmh, and must not exceed a width of 700mm. A total of eight devices were seized, the first time the LTA is doing so under the newly effective Act. The PMDs weighed an average of more than 30kg. The LTA has deployed active mobility enforcement officers to deter reckless riding behaviour since 2016. Riders were mostly issued advisories for unsafe behaviour. Mr Willy Soo, a manager at the LTA's Active Mobility Enforcement Section, said: "We have continued our usual deployments. The only difference... is that from May 1 onwards, we can actually give out a fine to errant users." One of those caught with a non-compliant e-scooter was a 37-year-old, who gave his name only as Mr Wong. His scooter weighed 37kg. Mr Wong, who works in the food catering industry, said he bought his e-scooter about 11/2 years ago for over $2,000. "I know it won't pass (under the law), but I couldn't sell it off. Without my e-scooter, I will now have to take the bus," he said in Mandarin. Under the Active Mobility Act, PMD retailers cannot sell non-compliant devices, and must display warning notices containing rules of device usage. Mobot director Ifrey Lai said: "The measures are effective to control compliance of offline retailers, but it would be difficult to enforce on online retailers - the reason being they are not required to disclose their company name and address." New rules to be introduced early next year will require cyclists and users of personal mobility devices (PMDs) to lower their speed limits on footpaths from 15kmh to 10kmh. The move, however, found little support among some cyclists, who told The Straits Times that it is difficult to manoeuvre at 10kmh. Enforcing the limit would also "burden the Government in terms of enforcement and, in turn, tax-payers", said National University of Singapore transport researcher Lee Der Horng. They were commenting on a Transport Ministry statement yesterday that the Government has accepted all the recommendations made by an advisory panel for safer path sharing, and they will be implemented early next year. The recommendations of the Active Mobility Advisory Panel, submitted on Aug 24, include making it mandatory for cyclists to wear helmets when riding on roads. This will not apply to users of PMDs, which are not allowed on roads under the Road Traffic Act. Another requirement that will be introduced is that PMD users and cyclists have to "stop and look" out for vehicles at road crossings. 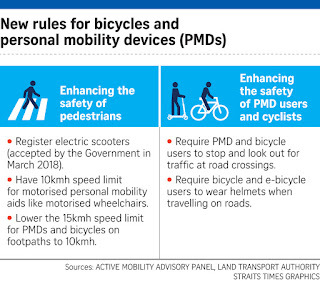 There will also be a speed limit of 10kmh imposed on motorised wheelchairs and mobility scooters to prevent "able-bodied users from abusing such devices to circumvent stricter regulations on PMDs" and "safeguard the use of such devices for those with genuine mobility challenges", said the ministry. It also strongly encourages the take-up of third-party liability insurance, "in particular by food delivery companies for their employees". But the ministry said that it does not recommend mandating the insurance, to place "greater focus on upstream prevention of accidents". It added that a registration regime for e-scooters will be implemented in January next year. "In accepting these recommendations, the ministry agrees with the panel that the safety of all active mobility riders and public path users is paramount," said the statement. Most cyclists interviewed said that they support the move to make helmet use mandatory on roads, but some are against lowering the speed limit. Dr Lee suggested that instead of introducing these regulations, the authorities should ban PMDs on footpaths altogether or build dedicated pathways for these users. Mountain biker Jefferson Ng, 56, said it is not easy for cyclists to manoeuvre at 10kmh. "While I understand the intention behind the speed limit, maybe it would be more practical to apply it at certain zones, like schools or bus stops where there are many pedestrians," said Mr Ng, who works at an events company. He added that more effort could be put into educating people instead of penalising PMD users and cyclists first. Another avid cyclist, Mr Kiki Matthias Cheng, 46, a production manager, acknowledged that it may be hard for some cyclists to adhere to the new speed limit because they are too used to riding faster on footpaths. "But for now, we are all sharing the paths, so we have to be considerate," he added.